Online game timer modified. You start with 90 seconds but get a few seconds added for each action you take. Magical Name - "To Mega Therion"
Hi, on version 1.033.A, when I spectate a duel in Checkmate server, the players name often switched. For example, when I spectate it, player A used blue eyes deck, and player B used eidolon deck. But when I check the replay, it's the opposite, player A used eidolon. Is this a bug in the program? @PHON It's not a problem. You should read the instructions when you download something. Activating spells from the hand has started failing as of yesterday when version D was released. I am still on the last version on a MAC (Yosemite). Can you explain why this has happened? It's occurring to all players. When trying to download version D the link takes you to a super spam page that tries loading garbage. HI , I HAVE A PROBLEM WITH CODE 12002, what happend ? I tried the Checkmate server. The monster, magic, and trap activation is not working. When I duel it keeps disconnecting half way through. Is this related to the new update? Hi, I'm running MacOS 10.12.2 and the application will not open at all. I've tried reinstalling, cleared the app with security settings etc but to no avail. Hoping there is a fix soon, thanks! I have a problem called code 12002 as well. How do i fix this? I have ygopro for mobile and I'm confused about to install the update. There's usually a download link for it. What do I have to do to get the update? When the update box is displayed and I click update, it displays the error message: Update failed with error code 12002. Now check all the firewall and internet settings and everything is ok as always. Also, when I'm in Online mode, the connection drops off. Would appreciate any help please. well never mind that lol.. I updated ygopro on my mac but it crashes the moment I open it. Is there a way to fix it? Thanks! Hey, I think there is some kind of glitch with Master Peace, The true Dracoslaying king. I am able to tribute just one continuous Spell/Trap instead of two like a normal tribute summon. is this a bug or is this actuall how the card works? 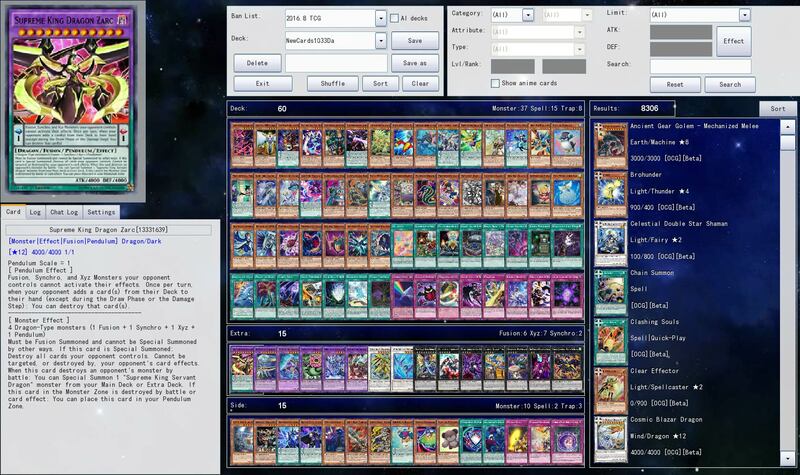 when will the YGOpro android ver 1.5.2 with all of this cards and new cards like roll of faith/five star twilight come? I cannot chain, no chain link. why? im losing my duel because i cant chain cards after my turn? please fix it thank you!!!!!!!!!!!!!!!! Whenever i download Ygopro installer on the discord page, My antivirus picks it up and claims that its band so it was deleted. What is the difference between manual install and the Installer itself? While hi Percival18, erm i have this issue is that whenever i open the ygopro in this server but i couldnt type any alphabet letter or number in this app in window, is it possible to help us download easier way without using discord? Soooo...is there a way to get this update without needing Discord? Because the link just takes me to a page that I can't interact with in any way, shape, or form. running mac os sierra and it keeps crashing when i try to build a deck. anyone have any fixes? When are you going to release/update it for Android? 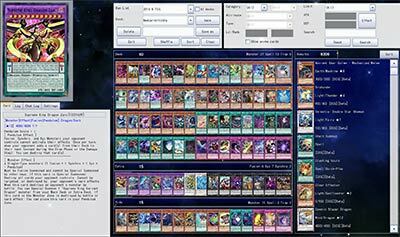 I am concerned about the link update that will take place on YGOPro, hopefully that can get to us sooner. Also, the "Invoked" arquetype with Aleister and all of the fusion monsters are reversed as if they were "Eidolon" on my YGOPro, I'm using a Macbook Pro, OS Sierra. Thanks for taking time on reading this post. It says this Oh noes! It seems this Discord Server is not setup correctly or we are having issues fetching data! Admin: Make sure "Enable Widget" is checked and an "Instant Invite Channel" is selected on the "Widget" section of your Discord Server settings. It can sometimes take 10 to 15 minutes to start working if you have just setup your server. on the page and I dont now were to dowlonded can some one help me, thaks. how long till vs ai is added? Hey, I want to download this version of the game but the link is broken. Can anyone give me the actual link? For those asking how to download. You must go to their Discord server. If you dont know what Discord is, google it and download it. Once you do, open the program. Then come back here and click their Discord server and it will open it in the Discord program and you will find the link there. Please Add a newer Android Version. I Would like to Play Link monsters. When will the new update take place? Especially for the current and new ban lists. Also, we need the newest cards in the game as well. when comes the new cards from the recent editions? when will a newer version for android? I can't download it at all. It tells me to complete an offer and after I'm done doing whatever it is it still wont let me download it. I keep trying to open the demo, doesn't seem to be available anymore. Loved it when I had it on my phone but it was taking up to much memory space and really slowing down my phones processing speeds. To be able to literally open up my chrome browser and have it run quickly and efficiently would be a god send because I don't always get the opportunity to try out my decks in actual tournaments, being able to build them and test them online is much more efficient and effective for being able to understand how your decks work and the ability to create new combos you would have never thought of. I really hope this becomes an actual browser run version of this game, there really isn't anything else out there that operates on chrome. Such unappreciative people. They're not going to do all these revisions and release more software just because you come on here and order them to do it. Plz update Master rules 4 + all the Link stuff for Android version. It has been 1 year. Plz. Please add pre-errata cards and anime cards too on the next update thanks. cant create host, cant choose room/allowed cards/kick player.